HUMBOLDT STATE – By the time the Arcata Eye ceases publication in 946 days (on Feb. 14, 2014), all 768 issues it has produced so far, plus the 135 still to come, will likely be as close as one’s iPad 7, and text-searchable at a Humboldt State Library website. That ease of use will come only after a difficult process of copying years of Eye PageMaker and InDesign files from various forms of media used to back them up since 1996. Those include Zip disks, CDs and hard drives. The thousands of files must then be processed, dated and distilled for online viewing. Doing the heavy lifting on the project is Systems Librarian Jeremy Shellhase. He and Joshua Meisel, assistant professor of sociology, initiated the project. With his classes and in special fora featuring community experts, Meisel has focused on media treatment of controversial issues. He hopes to compile, among other things, a complete collection of Eye cannabis stories over the past 15 years. Meisel braved the Eye’s musty archives to assemble a near-complete collection of the first 13 or so years of physical Eye editions. But the most useful version will be the digital archive, which Shellhase will shepherd to fruition. With the data scattered across multiple forms of media, and even individual editions fragmented into several files, it’s no small undertaking. But Shellhase keeps it simple. “Basically what we’re going to do is open up the files and save them to a pdf, join each issue up and index every word,” Shellhase said. The biggest obstacle, especially in these financially starved times, is lack of resources. Specifically, the people to help with processing the data. Shellhase hopes to gain some insight and assistance from the American Library Association’s California Digital Newspaper Project, which is also digitizing small regional newspapers. A preliminary test resulted in successful assembly of some editions from 1997. That’s something of a miracle, since in those pre-pagination days the paper was created in chunks for physical paste-up. “It’s not going to be a perfect database,” Shellhase acknowledges. The 1997 pilot editions suffer from awkward font substitution and missing graphics problems. Still, the essential data – the news, opinion and features – is there and readable. At some point, Shellhase said, the compiled editions will be placed on “the cloud” for public access. “Long term, this will be a great resource,” said Mary Kay, collection development librarian. While back editions of the Arcata Eye and Arcata Union are available on microfilm in the HSU Library, searchable text is far more useful. Yet, while the library staff is busy digitizing yesterday’s dead-tree media, dissident cyber-agers are pushing back. Today’s all-pervasive digital world and its instant-gratification charms have not entirely ensnared today’s college students – some go for Old Media in all its analog glory. 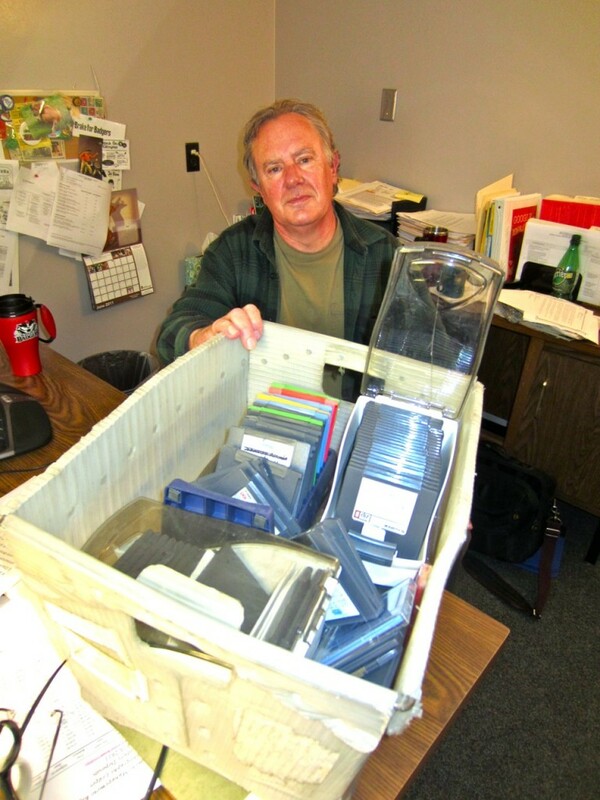 “There’s a real strand of that – kid who have turntables and think microfilm is cool,” Kay said. Kay enjoys the Eye and the McKinleyville Press. “Community newspapers are so great,” she said. This entry was posted on Tuesday, July 12th, 2011 at 8:22 am	and is filed under News, Community, Media, Technology. You can follow any responses to this entry through the RSS 2.0 feed.